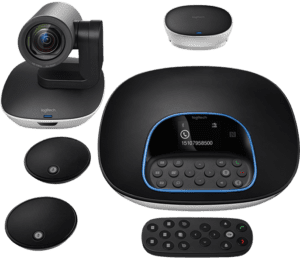 Skype, Zoom, Webex and other soft codec conference solutions have fast become a very popular form of collaboration replacing traditional video conferencing systems. To use Skype all you essentially need is a PC and internet connectivity. This is ideal for a one on one conference, but not ideal for a boardroom or huddle room. We provide numerous AV equipment to provide for larger areas and audience in a Skype conference. A sales executive will contact you to correctly specify a Skype conference solution for your application, budget and venue.